This recovery couch features a sturdy Birch frame and innerspring construction. A built-in paper dispenser and cutter band make it easy to change paper between uses. WMC Recovery Couches will help your students feel better in no-time. With Quality craftsmanship using premium materials, you can enjoy many years of comfort and support. Frames are assembled using 16-gauge staples and pocket screws to ensure that couches are solid and sturdy. 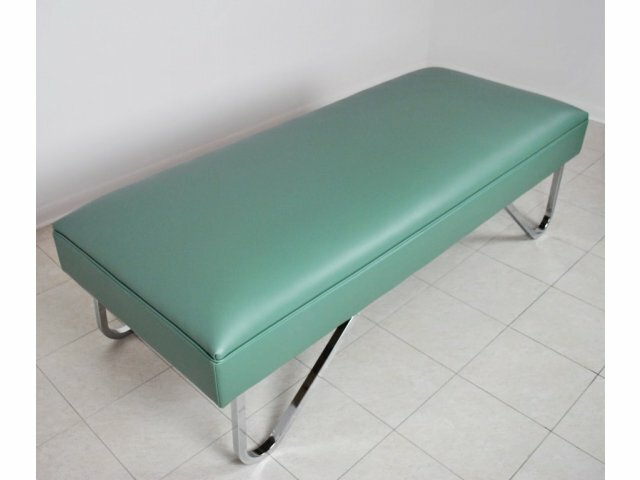 These recovery couches are designed to promote health and cleanliness. They are upholstered with advanced BeautyGard, which protects against bacteria, fungus, mildew and oil. This material is also easy to wipe-down and sterilize between uses. Each couch is custom-made to fit your selection, so you get exactly what you need to support those who need it most. Sturdy Frame: Made of 21mm 15-ply Birch, manufactured with hardwoods and exterior resins. Supportive Padding: Fire-retardant, 2"-thick foam has innerspring construction, which reduces sagging. All Inclusive: Includes paper dispenser and cutter band. Healthy Upholstery: Advanced BeautyGard contains agents effective against bacterial and fungal micro-organisms. Mildew and oil resistant. Colorful Selection: Upholstery is available in a wide array of colors to coordinate with your space. Tough Connections: Frame is assembled using 16-gauge staples and pocket screws.